49. Offer fruits and jellies. UPDATE: More discussion about this topic, with some serious warnings against feeding jelly from an internist and someone who works with animal nutrition on captive birds, is on my blog post from April 9, 2007. Those comments need to be taken with the usual grain of salt. The internist really has no clue about avian physiology—birds don’t have any such thing as a “satiety gland.” And the animal park handler deals with captive birds, which have no choices in food other than what is provided. Even when I’ve had birds feeding most voraciously on jelly during frigid days during migration, I could observe them taking wild foods, too. The truth about jelly is somewhere between it being an ideal everyday food for birds and it being toxic. I looked up the article I wrote for Birder’s World magazine, for the April 2005 issue, “Birds with a Sweet Beak.” In it, they used my photo of “Jelly Belly,” and I’m very clear about hazards of jelly. Indeed, Chuck Hagner, the editor, wrote in his From the Editor column, “We asked our friend Laura Erickson to tell what she’s learned about using fruit, nectar, and other high-carb treats to attract songbirds. Her advice: Don’t put out too much grape jelly.” Anyone who might claim that I “push” jelly-feeding is flat-out wrong. My personal use of jelly is less than it was in the 1980s, and I always offer oranges as well as jelly, but the fact that some birds prefer the jelly, and that no birds feed on the jelly more than a few times a day and can be observed taking natural foods, tells me that the birds are pretty good at figuring out their dietary needs. Unfortunately, corn sweeteners and beet sugar are both usually made with GMO products, which exact an environmental cost in several ways. And sugar cane has a lot of problems—that grown in Florida has had a huge, negative impact on the Everglades. Obviously, never ever give any birds anything with artificial sweeteners. The sugar, wherever it comes from, is the critical source of nutrition in jelly. Although most songbirds require diets that are high in protein and fat, some need a higher-energy diet, which they get mainly from fruits and nectar. Some species that never visit feeders for birdseed will come for fruits. You can offer grapes, currants, apples, bananas, raisins, oranges, and other fruits. Never offer more than your birds are taking within a day or two, and make sure to compost the leftovers as soon as there is any sign of mold. In the tropics, birds are accustomed to picking up fruits at feeders. Here in the United States and Canada, fruit-eating birds expect their fruit to grow on trees or shrubs and are often oblivious to fruits in feeders. But after one or two birds discover this source of food, others will soon follow their lead. Orioles and catbirds are very fond of grape jelly, as are robins, some woodpeckers, and occasionally even tanagers. 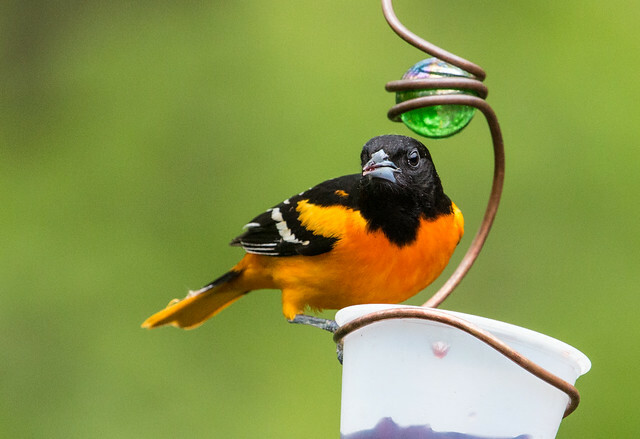 Some orioles visit feeders for orange marmalade or grape jelly all summer, long after they’ve stopped feeding on real oranges. This is fine for adult birds, which often need a quick supply of calories when they’re incubating eggs, brooding young, or hunting insects for nestlings. But jellies are not appropriate for fledglings, which need much more protein than carbohydrates. 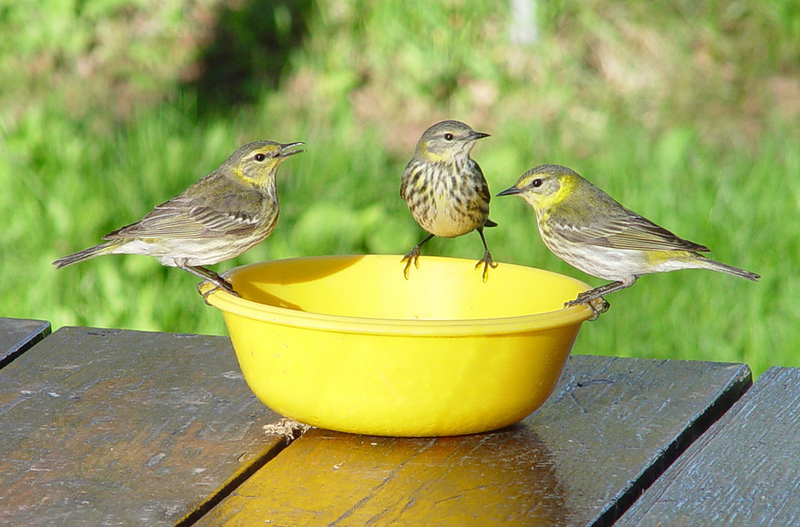 If adult birds are bringing their young to your feeders, it’s time to take in the jelly. If you enjoy seeing these young birds, set out mealworms for them instead. 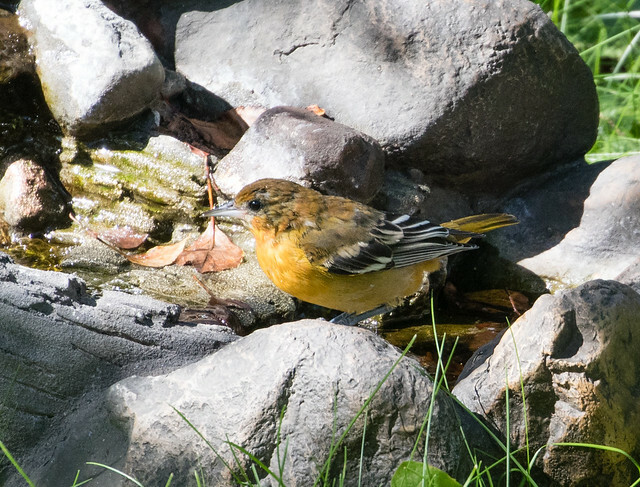 The sugars in jelly are much more concentrated than they are in natural foods, so if you offer jelly, make sure you provide clean drinking water in a birdbath. Jellies should be spooned into jar tops or similar small containers. Never set out more than a spoonful or two—birds may get mired in it, especially after the surface becomes sticky. One cold spring, I had dozens of migrating birds visiting my jelly. I had to be away from home for several hours, but because the temperature was below freezing and I felt that my orioles and tanagers were depending on me, I set out a large bowl of jelly for them. I came home to find a Red-breasted Nuthatch hopelessly stuck. 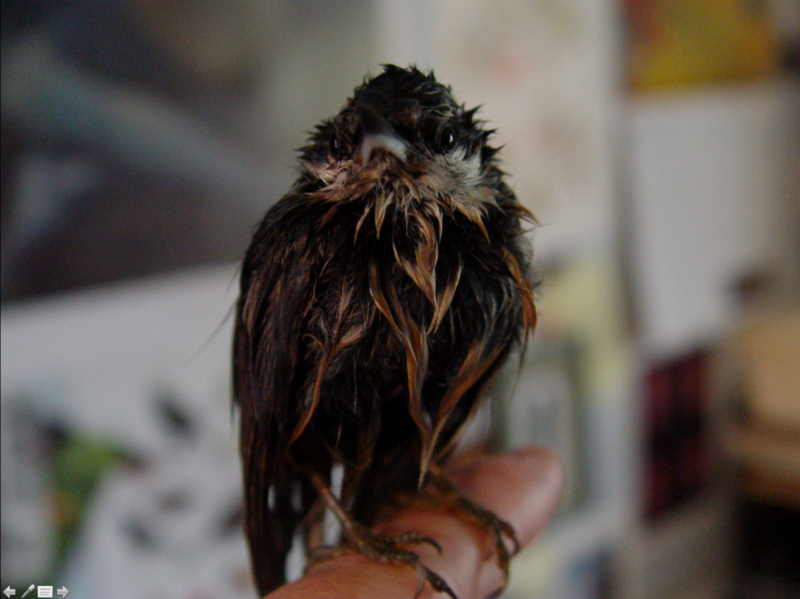 I fished him out and gave him three baths with warm water, drying him with paper towels and allowing him to preen between baths. It took almost four hours for him to be clean and dry enough to be released. Luckily, jelly washes out with plain water, so I didn’t need soaps or detergents, which can compromise natural oils. 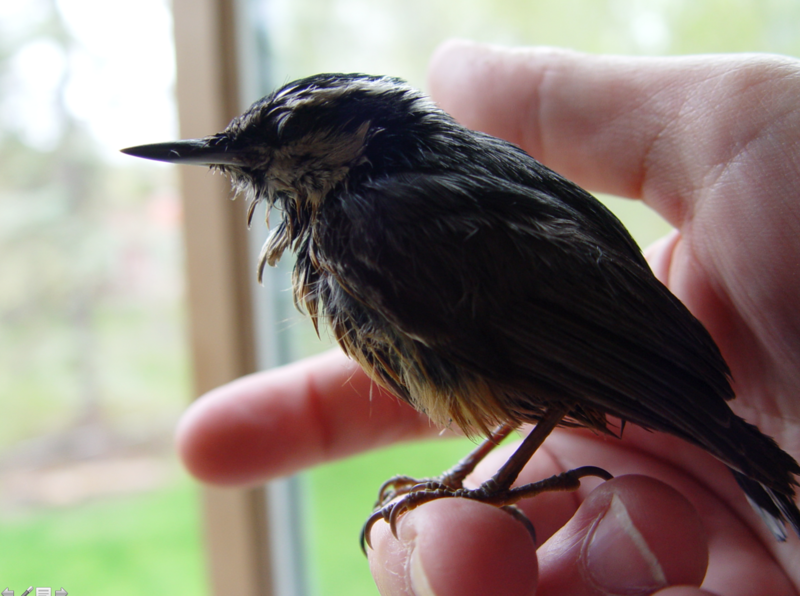 This situation could have ended much worse—the little bird could have succumbed to hypothermia before I discovered him. 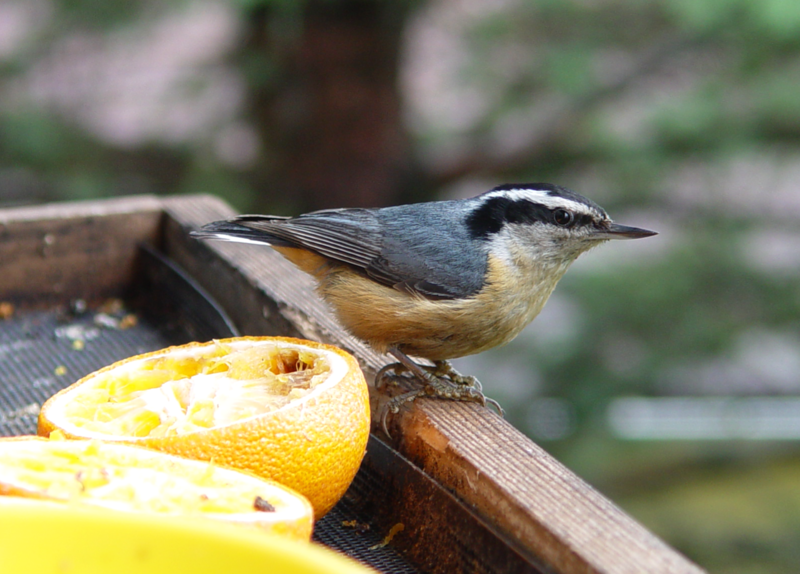 And thanks to my experience as a licensed bird rehabber and the fact that this particular nuthatch was accustomed to taking mealworms from my hand, he wasn’t very stressed. In fact, he ate lots of mealworms during his recovery period. After his release, he didn’t return to my feeders all day, but the next morning, there he was, good as new. As potentially dangerous as this was, I didn’t consider ending my jelly feeding. That spring was very cold, and natural food was so scarce that a huge variety of birds took advantage of my feeding station. But to prevent such an accident from happening again, I put out more feeders with much smaller amounts of jelly in each.